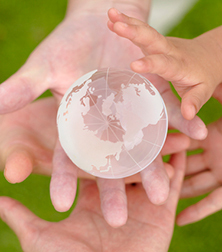 Promoting diversity is one aspect of KDDI's management strategy for achieving sustainable corporate growth. Accordingly, we focus on recruiting and training human resources. Rather than trying to force people to be the same, we respect the individuality of employees, striving to create an organization and environment that harnesses their individual capabilities. KDDI recognizes the importance of conducting its business from the perspective of women, who account for around half of its customers. To achieve this aim, we focus on cultivating and promoting female leaders. Through initiatives like these, we will pull together as a Group to ensure we are the company of choice for our customers. 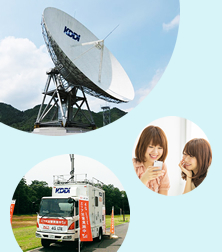 KDDI's management is thoroughly based on the Company's corporate philosophy, the "KDDI Group Philosophy." When formulating this philosophy, top-level executives and departmental leaders gathered to earnestly deliberate on what sort of company KDDI aspired to become, the management philosophy that top management needed to maintain to achieve this goal, and the working styles and values that employee behavior needed to exhibit. To ensure that all employees share the "KDDI Group Philosophy" in their works, we hold study sessions planned and conducted by employees themselves, as well as various other awareness activities. Sharing the Company's directions and values in this manner is aimed at achieving individual employee growth and sustainable development of the Company. Since FY2012, we have focused on cultivating female leaders, aiming to provide a place for them to participate in corporate decision-making and therefore reinforcing our power as a company. Specifically, we have set a goal for FY2015 of promoting 90 women to positions as line managers  (with female line managers then accounting for 7% of the total). To this end, we launched a program for promoting female line managers in FY2012, and have since conducted programs involving workplace training, group training, study sessions, and communication with role models. At group training sessions, the president and other Board members participate in roundtables, providing evaluations on presentations. To further augment our female leadership efforts, in FY2015 we will introduce a new initiative involving general managers in mentoring and coaching. We are working to cultivate female managers, and these activities serve as the foundation which we are building upon with the promotion of female leaders. 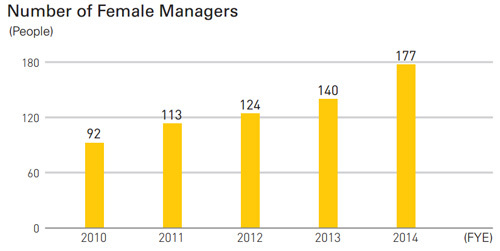 The number of female managers at KDDI rose for the ninth consecutive fiscal year, to 177 as of March 31, 2015. KDDI considers activities to promote the professional advancement of women a management issue and is undertaking serious and forward-looking initiatives on this front. These are having an effect, by raising awareness within the Company―even among women themselves―and the number of female line managers is increasing every year as a result. We see this as a major success. Nevertheless, with our focus on "embracing diversity," we need to conduct more activities focused on women if we are to resolve the many issues we still face. 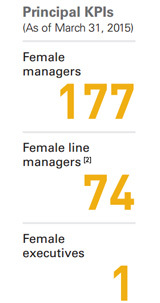 KDDI has set the numerical target for 2015 of having 90 female line managers, which would then account for 7% of the total. In addition to skill enhancement and career development programs, we are introducing telecommuting and making an active effort to support a balance between working and raising children. Still, there are few female line managers around us, so surely there are many female employees who feel uncertain whether they could become managers themselves. In an age that embraces female empowerment, I aim my best to work enthusiastically and serve as a role model to aspiring female line managers and encourage their efforts to advance their careers. 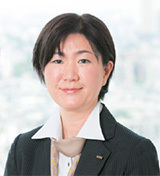 Ms. Saishoji was appointed as KDDI's first female executive in April 2014. As a method of providing instruction on management techniques, in FY2011 we introduced a new job title, "executive assistant," for people who serve as assistants to directors. The executive assistants sit in on all meetings attended by their superiors, learning their management approaches from up close. We appointed 11 people to this new position in FY2014, with 32 people having had this experience as of March 31, 2015. Following their experience as assistants, these employees are appointed to line manager positions in various departments. By giving employees the opportunity to learn management techniques directly from the Company's directors, we are cultivating the human resources needed for the KDDI of tomorrow. The Mission Grade System that we introduced for managers in FY2013 clarifies the management roles of line managers and the professional roles of managers in non-line positions, setting their rank in accordance with the size of their roles. 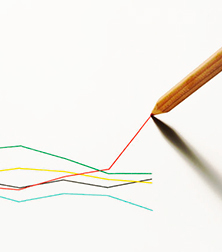 Rather than being evaluated on past operating performance, under this system the rank is defined according to their responsibility, authority, and degree of influence on the basis of current job performance. Our compensation system is designed to reward employees in accordance with their level of contribution. In response to the rapid wave of globalization, the KDDI Group is placing an emphasis on cultivating employees who have been locally hired overseas. 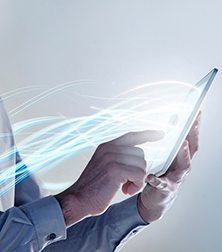 We position an understanding of the KDDI Group Philosophy as the basis for training. We also provide training on practical skills as needed according to employees' positions and skills, including understanding of services, through Practical Level Training. Mid-Level Management Training aims to cultivate an understanding of business strategies and augment management skills, and Senior Management Training cultivates human resources for leadership roles as location managers. 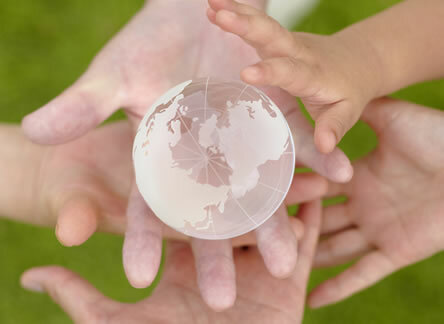 Through our Global Human Resources Exchange Program, we also provide employees hired overseas with opportunities to work for a certain period of time at our headquarters. This program aims to encourage personnel interaction between overseas locations and headquarters. 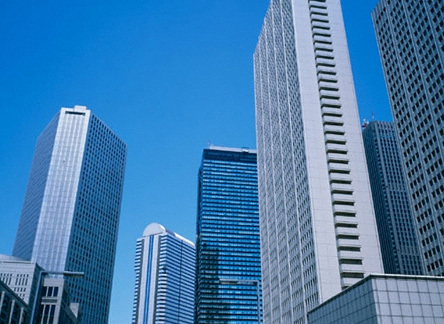 Twice during FY2014, we invited the management teams of overseas subsidiaries to Tokyo. They attended Global Management Meetings (GMMs) lasting approximately one week, including individual concentrated study sessions. The Overseas Subsidiary Business Ethics Committee met at the GMM in February 2015. At the meeting, management emphasized the importance to overseas management of reinforcing governance in such areas as graft, bribery, and anti-corruption. KDDI has set a specific target for the number of women to be promoted by FY2015, and is cultivating and promoting female leaders. We also promote flexible working styles in an active effort to support a balance between work and home life. As an evaluation of such initiatives, in FY2014 we were named a "Nadeshiko Brand" for the third consecutive year, a designation conferred on listed companies that take proactive steps to promote women. The "Nadeshiko Brand" is a joint effort by the Ministry of Economy, Trade and Industry and the Tokyo Stock Exchange to select and introduce companies that are attractive because of their proactive efforts to encourage the success of women. KDDI has been a "Nadeshiko Brand" since FY2012. We plan to continue encouraging the professional advancement of women, and believe management that incorporates a female viewpoint will lead to increased customer satisfaction. 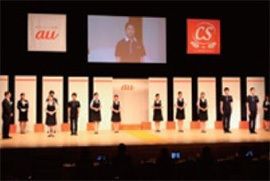 KDDI has held the "au CS AWARDS" in various locations across Japan every year since 2004. Aimed at achieving higher levels of customer satisfaction, these awards are designed to enhance the customer service skills of au shop staff. During last year's awards, we held a customer service competition themed on "sharing practical skills―acquisitions offering a value proposal." The most recent awards aimed to further promote examples of good customer service. Superior au shop staff shared their ideas about everyday customer service with presentations entitled "My Best Success so Far." By sharing this expertise, participants honed their customer service skills and gained additional tools for maximizing customer satisfaction. 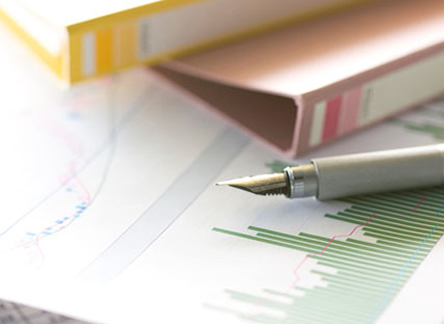 E-mail Alerts is a service that informs subscribers by E-mail of updates to the Investor Relations website, financial results, and other vital up-to-the-minute information.